I don't have much of a family in RL; this community is what I think of as my family . . . They gave me a gift more precious than anything: to know that they care about me irregardless of my status, my station or my mistakes; to know I had friends and family. I haven't had much of that in my life and it is a treasure to me worth more than any material thing. 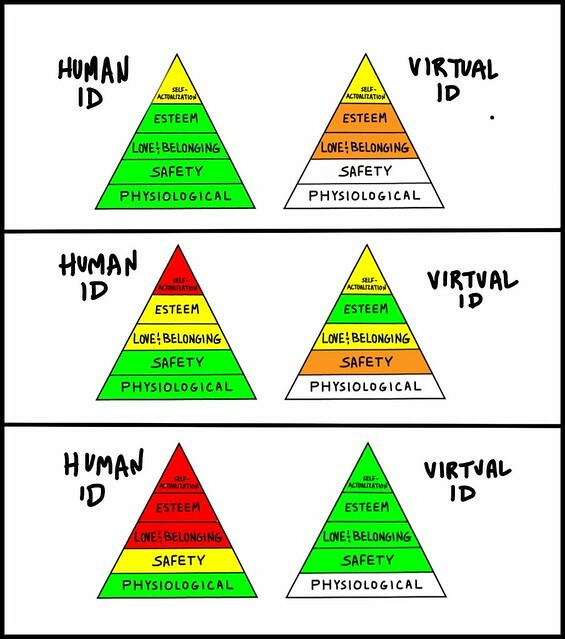 The graphic is a first swing at trying to visualize how different people may leverage their physical and virtual identities to meet Maslow's Hierarchy of Needs. I also saw this at Sabrinaa Nightfire's memorial, the Japan Disaster Relief stuff that went crossgrid and many other examples. Too much of modern life seems designed to isolate us from all but a tiny nuclear unit, almost mini-tribal. I think it's destroying the cohesiveness and awareness of people as people, as humans. Maslow's Hierarchy reminds us that not every need of a human can be met by a monetized frame of reference; indeed, some of the most valuable aspects and experiences of being human do not register on that kind of scale at all... to our detriment. I agree that virtual community is great for bringing together people from around the world who share an interest. My take on the impact of modern life on the nuclear family is that it actually undermines it. I think people had strong local communities when they had no other choice. A hundred years ago you depended upon your extended family, church and local community for all of your needs. Today, we can sit at a computer and be entertained, chat with people from around the world, shop, etc. without ever having to interact with even the people we share a home with. Although we can superficially keep up with friends and family via social networks, we can also easily tune out when the going gets tough, we're busy with other things or we just feel like it. I'm not proposing that it's inherently harmful, just that the verdicts out of the impact. I agree that consumer society wants us to believe that our unfulfilled needs for love, connection and esteem can be met by buying stuff. One thing I love about virtual life is that can lift us out of the mundane routine and offer new opportunities for creative outlet. But I think many of us fall back into a virtual routine, including the focus on consumerism. What we look like, not who we are. I do not have a nuclear family. In fact, I have no organic family at all, at any remove of either consanguinity or geography. Thus, I can heartily second Miso's sentiments about the virtual communities in which I take part, the simulated 3D worlds and the 2D social networks. (I also happen to be markedly non-consumerist in both organic and virtual modes, which makes me a double minority). Some, I suppose, might say that I am "compensating" for a lack of fulfillment in RL; I prefer to turn that coin over: fulfillment in virtuality obviates whatever organic need Maslow et al. insist that I have. Lalo: Virtual life obviously can't provide any of the physical needs people have such as food, shelter, clothing or physical contact etc. (Outside of providing income to purchase them if you have a virtual business.) But I think virtual life can potentially fulfill just about any of the "higher" needs on Maslow's list, since they are all of the mind, not of the body. Hmm. I wonder, though, if a virtual self can be self-actualized if the real self isn't, as you're showing in the third structure? Sean: The image is meant to represent a single "sentient being" who is expressing through two different identities and/or domains. Understood, but Maslow partially defined self-actualization as being able to embrace the reality of who one is and to "accept their own human nature... with all its shortcomings." It seems to me that it would be nearly impossible to do that with one's virtual identity unless you're able to wholly reject your RL identity. Which you'd need a Matrix-like environment for, I should think. I was using Maslow's triangle as one possible format to separate various human needs and potentials that one might attain/fulfill through physical or virtual identity. I'm not knowledgable enough about Maslow and his work to predict whether he would see virtual identity as inherently antithetical to the "embracing reality" aspects of his definition of self actualization. I suspect it would depend upon whether an individual in question used virtual identity as an extension of a biological self they still embrace fully, or a denial or escape from aspects of themselves they don't accept. - More efficient perception of reality and more comfortable relations with it. - Acceptance of self, others, and nature. - The quality of detachment; the need for privacy. - Continued freshness of appreciation. - The mystic experience, the oceanic feeling. - The democratic character structure. If Self-Actualization is an all or nothing state and the qualities he mentioned were signs that one has attained it, then one would be gold or red in both worlds. But if one may be more self-actualized in one quality than another, then it's possible that one might develop and/or express some of those qualities more readily within the virtual environment. For instance, I've spoken with many people who say that positive qualities such as creativity and self-confidence that they've developed through virtual identity were extended back into their physical lives. If the images aren't corrent in terms of Maslow's definition of self-actualization, they do reflect my own conception of how one might be able to develop and actualize the qualities he lists. For instance, I can see how being in a virtual world can help people ""accept their own human nature... with all its shortcomings." by giving them insight into the difference between the actual person on the on hand and the the prejudices and preconceptions that are commonly associated with certain biologica or psychological traits on the other. I think this is especially true for those who have dual identities but are open about both. So you don't deny the physical reality of the human, but still express creativity through the virtual identity. Is this another case of "It's different because it's on the internet!!!"? There are many people in your life you do not get to be with physically all the time- parents in another state, old friends who have moved away, your grown children... yet no one questions the reality of interacting with them on the phone or via email; no one declares they can't meet your needs for contact, reassurance, peer admiration, support, emotional bonding... I can say that certainly in my case, the feedback, contact and support I have received through SL is much more than I ever received in RL and is filling in some holes I have had for a long time. As regards my comment about "nuclear families" Botgirl... I think we agree; I just didn't state it as clearly. The "nuclear family" idea as a patriarchal, hierarchical tribe-unit is far away from the "extended family" structure. As Reich illustrated, this isolating-into-small-units has very negative effects on human societies (as I think are clear today). One of the terrific strengths of the network is rediscovering human networks and how valuable they are. I have two main hang-ups on the self-actualization thing. First, as one climbs Maslow's pyramid, the need satisfactors become more and more internal, ultimately becoming wholly internal with self-actualization. Self-actualization is all in your head, as it were, and where both the RL and virtual identities would ultimately reside. Thus, my thinking is that a virtual identity can't contribute to self-actualization unless the real identity is completely removed and/or negated. Which leads to my second problem. That a virtual identity, by definition, is removed from reality. Thus being wholly reliant on a virtual identity for self-actualization is fundamentally ignoring the reality of a RL one. That strikes me as a significant contradiction... again, unless the virtual world in which the virtual identity inhabits is so totally immersive that one doesn't even realize it's virtual in the first place (a la The Matrix). You wrote: "Is this another case of "It's different because it's on the internet!!!"? " I guess there are two aspects to consider. One is virtual interaction vs. physical interaction. The other is virtual identity vs. human identity. There are obviously some differences between physical and virtual on both levels. I think most are more form than substance, but I also think some are consequential. Virtual interaction for people using human identities is becoming the most common form of communication for some demographic groups as you mentioned: texting, IM, social networks, email, etc. There is a lot of research pointing out various differences between virtual and in-person communication. But there are also differences between various types of in-person communication such as unstructured vs. facilitated meetings. So I guess where I'm going with this is that making blanket statements, pro or con, about virtual vs. physical communication isn't very illuminating. Probably keying in on a particular use case might be a good way to hack into it. I think there are more significant differences when it comes to friendships and relationship in pseudonymous vs "open" identities, virtual or otherwise. For instance, can you think of any scenario for a physical friendship or romantic relationship where it would be okay to keep one's name, job, phone number, home address and other such aspects of life secret? I can't. I'm not saying that one is necessarily better than the other in all cases, just that there are some really big differences. You wrote: "a virtual identity can't contribute to self-actualization unless the real identity is completely removed and/or negated. . . a virtual identity, by definition, is removed from reality. Thus being wholly reliant on a virtual identity for self-actualization is fundamentally ignoring the reality of a RL one. I guess the first question that comes to mind is what you mean by "identity." If you mostly mean name and presentation of appearance, I can make the argument that virtual identity is no more or less "real" than human identity. The name someone uses for their human identity is not part of a their genetic code. It is a label used to identify the underlying person. The name that a person uses in a pseudonymous virtual identity (vs. anonymous) serves the same purpose. They are both "real" in that they serve that identifying function for their respective domains. I am authentically Botgirl in that the sentient being who uses that as a label for identification is me. I don't think that self-actualization means forsaking privacy. Having a virtual identity without publicly disclosing it's connection to a human identity isn't inauthentic, it's a legitimate privacy decision. In both human and virtual identities, expectations for disclosure vary and are based upon domain, situation and relationship. Our conception of an appropriate level of personal disclosure is a cultural construct. this is one of the most meaningful and significant threads i've experienced since i've been a netizen of the omniverse. it is certainly more significant than questions of whether my identity is ambiguous or whether anyone needs to know my typist's RL name. i consider it a real and a rare privilege to be able to say you folks are my friends and, indeed, my family. Wonderful thread. I am as anonymous, or not, in real life as in virtual life. When i walk around in real life only my closest friends know my name and where i live. As in virtual life. I dont go around a club and tell everyone my real name and social security nr in real life either. Is that common? Identity, as I look at it, has absolutely nothing to do with what you look like. It is entirely about what's going on in your own head, and how you think about yourself. You can identify yourself as a mother, an artist, a leader, whatever and the sum total of those identifications is your identity. So if your identity is defined by what you think of yourself -- what goes on in your own mind -- then any virtual or real ID is just a construct to channel that identity. As of yet, though, we're unable to remove the mind from the physical brain, and the two are inexorably linked. Meaning you can disengage your mind from an SL avatar (even if it continues to carry on actions on its own!) but you're unable to disengage your mind from your actual body. Not without dying, at any rate! So my basic argument here is that self-actualization -- a process occurs entirely in the mind, and is essentially beyond external influence -- cannot occur through a virtual ID if it does not also occur in a real one, because both the real and virtual IDs are entirely dependent on what's going on in the mind of the individual controlling the avatar, whether it's digital or made of flesh and bone. Wizzy: Thanks! That's great to hear. Sometimes it feels like we just keep rehashing the same stuff, but conversations like this keep me inspired to keep plugging away. Mera: I agree. Norms of disclosure are situational. Sean: I agree with you that it's all in the mind. I don't think that there are two beings who get self-actualized, just two different environments and identities that are used in the process. I don't think we are far apart in what we believe, more in the point of view we're taking and some semantics. Ohhhh totally agree; zen-arrow moment. This debate is centuries old (who am I? )and blanket statements haven't served well for a long time. For the most part, humans have various personae/identities they present/use in varying situations. This is part of the primate need for privacy. This need is recognized and used by architects to configure group spaces for longterm use. When I go to the store, bar or library, I present the parts of identity required of me by those places: library card, age verification, etc. But I do not hand them my mailing address, social security number, email... I present a part of myself. The current push to "define identity" seems less to me like an exploration and more like fitting people into boxes for exploitation purposes (excluding people like you, Haraway and Turkle, who are honestly engaging these questions). I agree with most of your points, but I don't think the drive to "share everything" is strictly a function of government and commercial interests. I think the technology itself, or "the message of the medium" influences us both personally and culturally to dramatically increase both the scope of what we share and the breadth of who it is shared with. Privacy in the scope of human life on earth is fairly recent. There was almost a complete lack of what we now think of as privacy within hunter gather cultures. So I can't rule out that we may end up heading back in that direction if the (technological) environment pushes (or pulls) us in that direction. @mera i totally agree sister. this is my big disagreement with the whole "Ambiguity of Identity" thing. The history and development of Modern Philosophy is *all* about the "Quest for Certainty." this has to do with the question of how we know anything. the point of departure is that we really know very little with certainty. as we walk around our so-called RL world, very few RL people *know* us. we are totally ambiguous RL creatures. no one knows our name, letalone what is going on in our heads. this is why the assertion that "Ambiguity" is something unique to a virtual avatar is so ludicrous (and sophomoric) to me. Wizzy: What I love most about virtual worlds/identity is that it can bring to light aspects of physical life that we usually don't notice. Outside of philosophers, psychologists and college students tripping on acid, I don't think most people question the mental model of a clearly defined, relatively fixed identity. I think the reason conversations about identity often start off pretty sophomorically is that our reflexive ideas reflect concepts we've acquired without much analytical thought or deep introspection. Or we use a word like "identity" without having a distinct and shared definition for what we mean by it. But if we hang in there with each other (like we're doing in this comment thread) I think it's possible for us "amateurs" to examine some of our preconceptions consciously together and see if they hold up under analysis. @Wizzy we thinks exactly the same way. I agree with what Botgirl said last; "What I love most about virtual worlds/identity is that it can bring to light aspects of physical life that we usually don't notice." that is so true its scary ... virtual worlds has actually taught me things i didnt know about myself and for that im thankful.